Quick Medical Dx & Rx is a collection of evidence-based outlines of conditions and disorders most often encountered in medical practice. Fitzpatrick’s Color Atlas of Clinical Dermatology facilitates dermatologic diagnosis with color images of skin conditions. Differential Diagnosis Tool allows you to browse 1,000 diagnoses by symptom, disease, or organ system at the point of care. Diagnostic Tests aids in the selection and interpretation of commonly used tests, including laboratory procedures in the clinical setting. You need a personal account to use the AccessMedicine® app. Go to AccessMedicine from the library’s home page. Create your user name and password. Download “AccessMedicine App – Unbound Medicine, Inc” onto your mobile device. 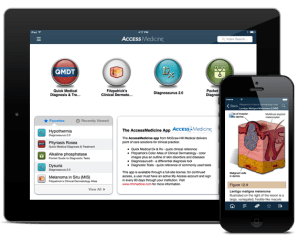 The AccessMedicine app is available for Android and Apple Devices. Open the app and activate it by entering your user name and password. Note: to ensure continued access to the app, you must sign in every 90 days through the library’s home page. For more information, contact library@pcom.edu. Detailed installation instructions are available here.